How did you come to be part of the vision industry? Midwest Optical Systems, a manufacturer of precision optical components and systems, started in the 1980s with facilities in the United States and Singapore. I personally spent many years living and working in Singapore in the 1970s and 1980s. Because of the country’s long-standing emphasis on developing high-value manufacturing, many companies in Singapore adopted machine vision technology early on. As more companies turned to machine vision for inspection with semiconductors, electronics and other applications, they looked to MidOpt for technical help. Our customers’ needs quickly became more sophisticated, and our knowledge and experience also grew rapidly. We transferred what we learned in Singapore to our offices in the United States. What role does North America play in the development of machine vision? 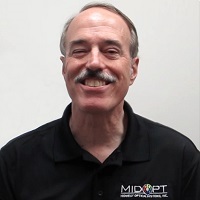 Much of MidOpt’s current product development and demand comes from North America, which I imagine is also true for other companies in the machine vision industry. To put things into perspective, about 10,000 robots valued at approximately $515 million were ordered from North American robotics companies during the first quarter of 2017 – a growth of 32 per cent in units over the same period last year. This growth is in large part due to the increase in orders from the automotive industry, which were up more than 50 per cent. The United States is now third in the world for robot use (behind Japan and China), and this number is expected to continue growing. I can’t overstate the importance of North America in the machine vision marketplace. What do you see as the major growth sectors? In general, growth can be attributed to the steady advancement and development of higher resolution and higher accuracy applications, as well as the expanding use of traditional machine vision technology in many new industries, including agricultural health monitoring, security and surveillance, autonomous vehicles, 3D point cloud imaging, and other applications, many of them embedded, as well as collaborative. What technology challenges does the vision industry face? The rapid changes in the machine vision industry can make it difficult to keep up with demand and technological advances. As former developing countries advance into the 21st century and companies and governments put more resources into educating their workforce and keeping up with these changes, it encourages all of us to do whatever is necessary to stay competitive. This applies to both new product development and incorporating newer manufacturing technologies. What will be the most significant commercial change in the years ahead? The constant change in, growth of and wider adoption of machine vision in new areas leads to companies within the industry becoming more specialised in what they do and which markets they serve. It will become increasingly more difficult for many companies to do everything for everyone and remain competitive in a growing, global economy.